Don't worry, "Dracula's Blood Pudding" ice cream is not made from human blood. It's not a grotesque horror film — it's gourmet! Salt & Straw, an Oregon-based ice cream maker, is releasing Halloween-themed ice creams that are concocted from eerily delicious ingredients like pumpkin tea and black cocoa. The artisanal ice cream shop with locations Portland, Seattle and San Francisco, is famous for its wild pairings, like blue cheese with pear and black raspberry with smoked ham (but they didn't invent the wildly divisive mayonnaise-flavored ice cream). But Salt & Straw's latest flavors, which will hit a handful of trendy West Coast scoop stores Friday, may not be for even the most adventurous of eaters. That's because they have actual blood and real meal worms in them. Don't run for life just yet. Salt & Straw's head of research and development Kat Whitehead told TODAY Food that its daunting Dracula's Blood Pudding flavor was actually inspired by "a classic" Southern Italian dish. The dessert, known as "sanguinaccio dolce," is made with fresh pigs' blood (used historically as a binder or thickener in soups), sugar, chocolate and milk and became a Carnevale tradition preceding the Catholic season of Lent. Sanguinaccio means "blood sausage" and is rather similar to regular sausage in taste and texture. Blood, according to The late Anthony Bourdain also mentioned it was one of his favorite things to eat in a 2016 episode of "Parts Unknown." According to Whitehead, Salt & Straw sources the pig blood from Portland, Oregon's Nicky USA and combines it with warm spices like cinnamon, coriander and cubeb pepper and some brandy to create the cold, velvety treat. "When you taste our Dracula’s Blood Pudding flavor, the idea is not for the blood to be in your face — when I eat the flavor, I get spiced chocolate to start, but as the ice cream melts, you can start picking up on the presence of the pig’s blood," Whitehead told TODAY Food. "There’s a distinct salinity and minerality. Our goal was to make the pig’s blood a present component, but in a way where the other ingredients round it out." In case that doesn't have you screaming, salivating — or both — there are four more ice creams bubbling in Salt & Straw's seasonal cauldron (they're also available online for those who don't reside in California, Oregon or Washington). And one pint might just give you the jitters ... or at least some critters. 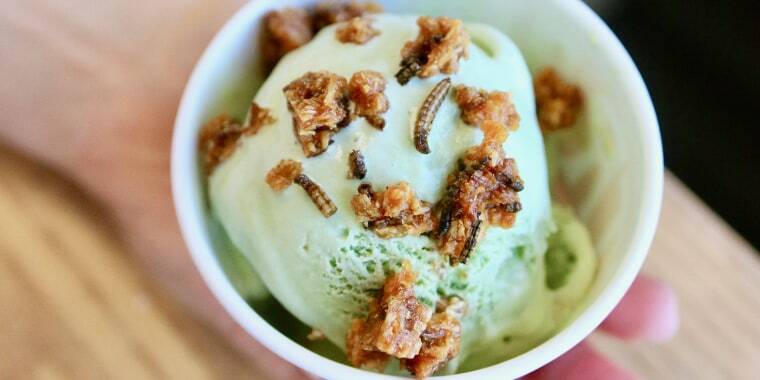 Creepy Crawly Critters is a matcha ice cream (so far, so good) that's topped with zesty orange and dark chocolate covered crickets and coconut toffee brittle mealworms from the Oakland, California's edible bug specialty store Don Bugito. What now?! If the all-natural crunch known to be a great source of protein is too much for your tastebuds, the October Spooktacular series also includes flavors that appear on a lot of autumn menus: a vegan Mummy's Pumpkin Spiced Potion with pumpkin Psychocandy tea steeped in coconut ice cream with candied pumpkin bits; a trick-or-treat overload called The Great Candycopia with butterscotch ice cream and homemade takes on Snickers, Twix, Heath Bars and peanut butter cups; and the Essence of Ghost. Don't worry, it's not just an empty bowl of air! This "ghoulish grey sherbet" involves swirls of black cocoa ice cream for a bittersweet, slightly smoky flavor. Sounds pretty eerie but it probably won't induce a blood curdling scream. Salt & Straw's new Halloween flavors are available starting Friday, Oct. 5 and will be scooped out at select shops until the end of the month.